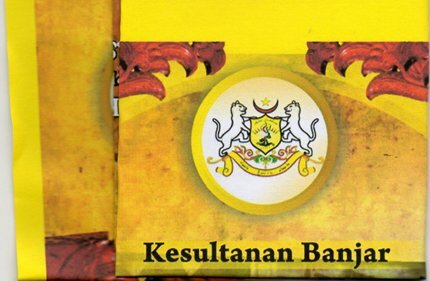 The former Sultanate of Banjarmasin has now been restored as BANJAR SULTANATE (locally "KESULTANAN BANJAR" ). Their State Flag is yellow over black in a horizontal bicolour. 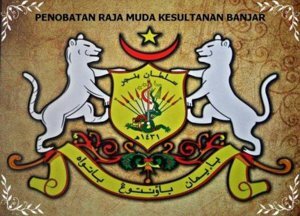 A scan of the Personal Standard of the Sultan of Banjar with his Coat of Arms. I have yet to draw this Standard, which is yellow (not golden-yellow) with a gold frill, the details of the shield from the Arms are shown (without the yellow edged disk, lions & shield itself) in the centre of the standard, (in the central shield -from the Arms- a device with a gold kris, an Indonesian flag is attached to the tip of the kris, a white rising sun with 5 golden rays on each side of the raised kris. 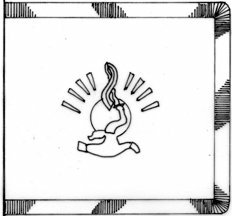 The central Arms on the Banjar Standard has only 4 rays (of the sun) on each side (not 5), also there is a gold wing (or something resembling a wing) just below the last ray. The central motif seems to be an arm & hand clutching the golden kris. This is my drawing of the Sultan of Banjar's Personal Standard. (Yellow with gold frill, white sun, gold rays, green ends to black emblem, gold keris with Indonesian flag attached). 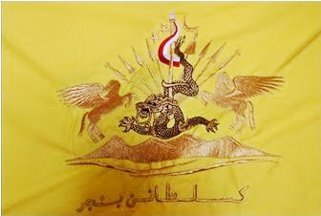 The flag is in yellow with the emblem (a gold Chinese dragon affrontee an upright sword with the Indonesian bicolour attached, to the top left are two 5-pointed stars reversed (one point downwards) & to the right is a crescent, both gold. Eight gold "pajong" (4 on each side), the last on each row has a crescent at the top (the bottom one of each row). Supporters: Two gold pegasus'. Compartment, a gold mountain ridge, below this are 2 gold "lines", below the compartement is a gold Jawi inscription). This emblem is in the centre of the flag, which is larger than shown in the colour photo, & must date to 1860 when the Sultanate was abolished by the Dutch. The current Royal Arms show the central emblem of the flag in their shield (minus the Jawi inscription above, & the Jawi date 1421 A.H. (A.D. 2000/2001) below. The flag and achievement for the inauguration of the Raja of Banjar Sultanate (2005) may be an indication that the Islamic system was used indeed. On the other hand it contains some symbols that are difficult to interpret as they seem to originate from a Chinese system of symbols. It would be interesting to know more about the time and manner of creation of these emblems.